Spaying or neutering dogs, cats and rabbits is extremely important. Pet overpopulation is at crisis levels. Millions of animals are euthanized - killed - every year because there are simply more animals than there are homes. An unaltered female cat can produce three litters per year. 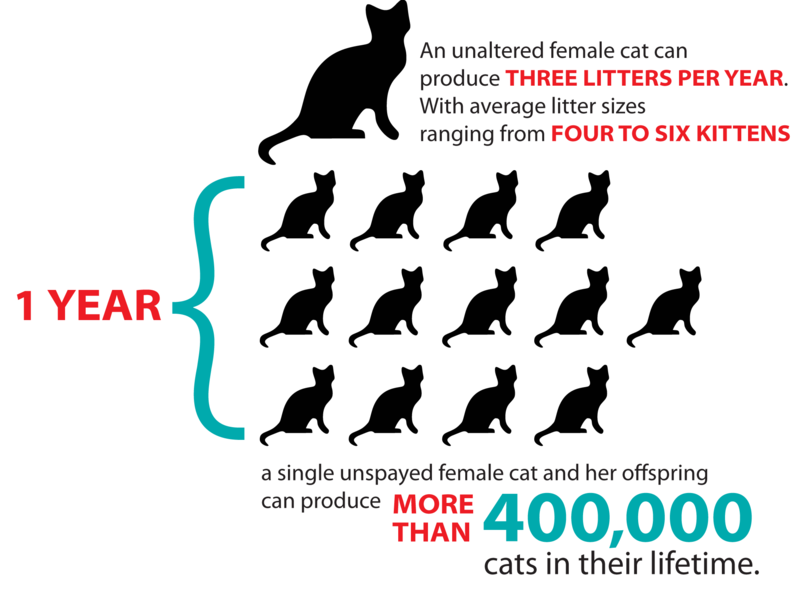 With average litter sizes ranging from four to six kittens, a single unspayed female cat and her offspring can produce more than 400,000 cats in their lifetime. Spaying or neutering your dog, cat or rabbit is the only responsible thing to do. It is perhaps the most important aspect of responsible pet ownership. By doing this you are ensuring that you are not contributing to the pet overpopulation crisis and you are eliminating many potential health problems, including reproductive cancers. (Some studies show that nearly 80% of unaltered female rabbits will get uterine cancer by age six). Spaying and neutering also eliminates behavioural problems such as the disruptive behaviour of a cat in heat and reduces destructive behaviour in rabbits like digging and chewing. Learn more about the benefits of spaying/neutering a rabbit.